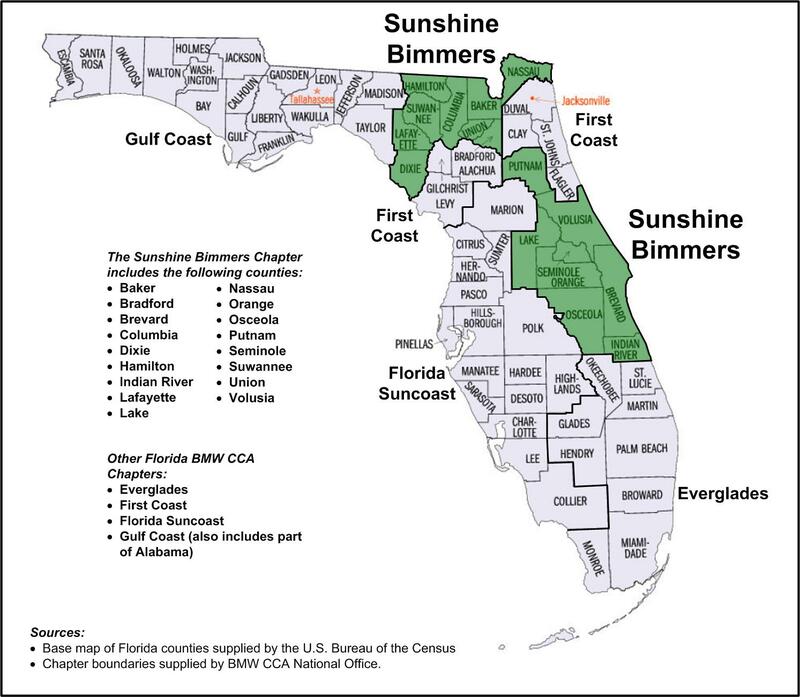 The Sunshine Bimmers Chapter is one of 16 BMW CCA chapters in the South Atlantic Region of BMW CCA. It was previously part of the Central Florida Chapter, which was split into the Florida Suncoast and Sunshine Bimmers chapters in the mid-1980s. 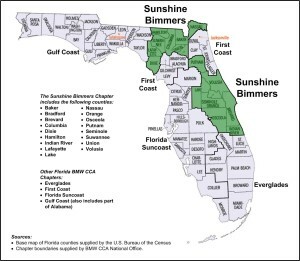 Membership consists of enthusiasts from the north and central Florida areas (see map). We attempt to enhance the BMW ownership experience through camaraderie, education and social interaction. Members can choose from a variety of events, such as on-track driving schools, adult and teen car control clinics, social gatherings, technical sessions, wine tastings, car shows, dinners, tours, open houses, and a variety of other activities. The mission of the BMW CCA Sunshine Bimmers Chapter is to promote our members’ interest in motoring and touring activities and to generally promote safe and skillful driving. To be a reliable source of information to enhance the BMW ownership experience. Provide a diverse, friendly, transparent, and safe educational and social environment for members. Emphasize member satisfaction, recruitment, and retention through the quality of our activities. Consistently deliver effective communication, verbally, online, and in print media. Present a diversity of activities that appeal to a broad range of member interests. Provide educational opportunities to members relating to operating and maintaining their BMW automobiles. Interested in Joining BMW CCA? If you are interested in the BMW CCA, click the button below to view our page about the benefits of becoming a member and apply to become a member!